Home featured NSA GLAC Book Launch ! Needing help promoting your book? Wanting a way to blast the news of your book to a large audience? 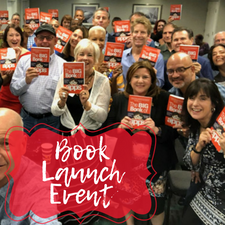 Wishing you had photo & video evidence of a huge group holding and LOVING your book? The entire NSA L.A. Chapter holding up your book in a photo & video selfie that is blasted out to everyone’s social media audience! A captive audience to give a live, 3-5-minute recorded presentation of the value of your book! Your video, book and profile proudly displayed as the “NSA GLAC Featured Author” of the month on the NSA GLAC website! A featured table display of your book for the NSA GLAC Chapter meeting! The link to purchase your book, listed on the NSA GLAC website AND shared with the entire NSA GLAC audience via e-mail and all social media sites! You must have physical copies of your book. You will give out at least 10 (or more!) COPIES for a GREAT selfie! All this for a small price of $350!